My name is Lily Tran. On December 7, 2007 my father passed away. A week after returning home from the funeral, I was sick with pneumonia. My primary care doctor prescribed me antibiotics and an inhaler. Two weeks later, I was still not feeling well. I was swelling and I was experiencing a sharp pain on the right side of my stomach. In January 2008, I went to the ER and they did an ultrasound of my stomach and saw something was wrong with my gallbladder and admitted me to the hospital for an operation to remove the gallbladder. The doctor said they took the gallbladder and looked it under the microscope and didn't see anything was wrong with it. But they noticed that my liver was swollen and yellow in color. So they did a biopsy and confirmed it was lymphoma. After the operation, I had liver and kidney failure. I was very swollen that I had lots of fluids build up in me. It was a shock for my family that I was sick since we just lost my father a month ago. The doctor announced to my family that I had one out of fifth chance of surviving. But God had anther say in it. The word lymphoma was foreign to me. I didn't know what that word was until my doctor said I had to have chemo then I finally realized I had cancer. I was shock but my faith was strong. I went into remission until 2014. 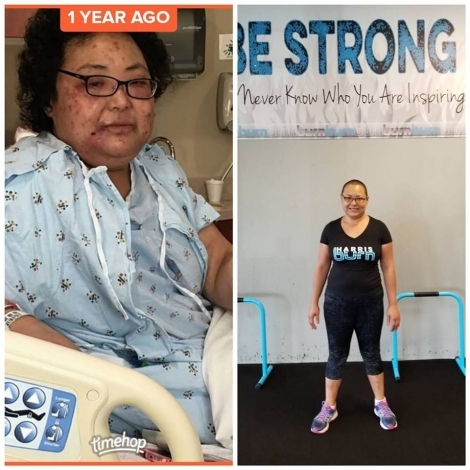 In February 2014, I went to see my oncologist because my primary care doctor suspected something was wrong due to my blood results during my physical examination. My oncologist examined my underarms and noticed a lump. He ordered a CT scan and confirmed there was a mass. Then he ordered a biopsy to confirm if it's reoccurring lymphoma which it was. He spoke of treatment and suggested I have a bone marrow transplant. He referred me to Levine Cancer Institute who has recently opened a bone marrow transplant unit. I had three rounds of chemo then I had a bone marrow transplant using my own stem cells. The side effects of the transplant weren't as bad as my second transplant which I will be telling you next. In May 2016, I went for a follow up CT scan and on the same day my transplant doctor contacted me and told me the cancer came back. The cancer was found in my chest the size of a golf ball and in my stomach as well. We talked about treatments and we were able to do another bone marrow transplant but this time we had to use my only sibling, Peter’s stem cells – he was a 50% match. I had my second transplant on August 4, 2016. I had a lot of complications with this transplant I was constantly in and out of the hospital for many infections. One of the infections were MRSA. Now I am in remission! I want to share my story with people who are affected by all types of cancer that there is still hope.